Just as ice formation can stop the flow of a river, extreme temperatures can stop the flow of data from remote operations. Because modern facilities and control systems run on information, even a brief interruption to data flow can introduce significant risk to operations. Commercial-grade Ethernet switches have proven to be especially vulnerable because they are not engineered to withstand the fluctuating temperatures, humidity, vibration, dust and other conditions common to remote installations. 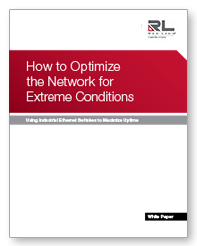 Request this white paper to discover how industrial Ethernet switches can make a difference in maximizing uptime in these environments.